December | 2016 | Does This Font Make Me Look Fat? 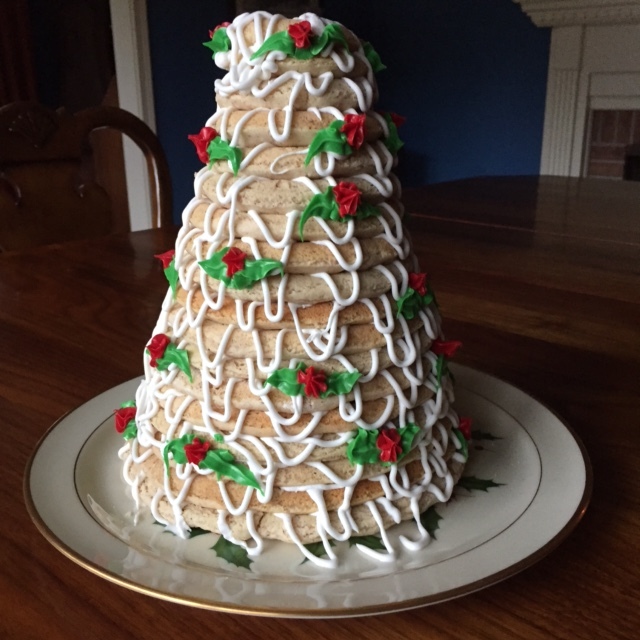 My blog readers know that I am Norwegian on my mother’s side, so I am sending you a photo of the traditional Norwegian wreath cake which is found in most Norwegian homes at Christmas. God Jul. If I were half Swedish this might be a photo of me with a wreath of lit candles on my head a la St. Lucia, the mythical bearer of light. The wreath cake is a lot safer. We had dinner Christmas Eve with my brother and sister-in-law. 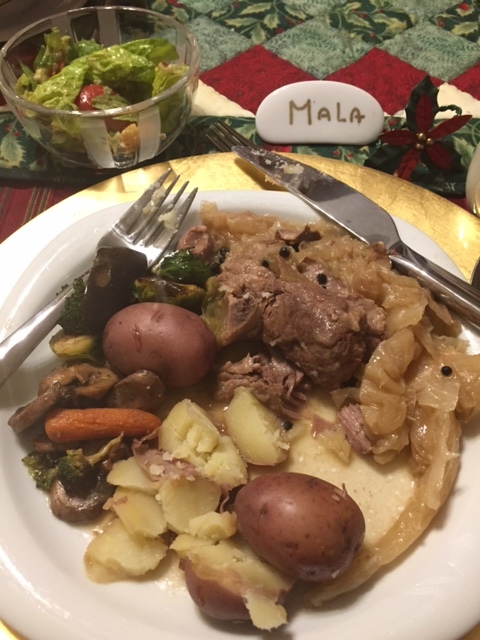 Farikol was the main dish (lamb in cabbage) which is another Norwegian national dish. It was delicious. My sister-in-law has her own tradition for dessert on Christmas Eve. 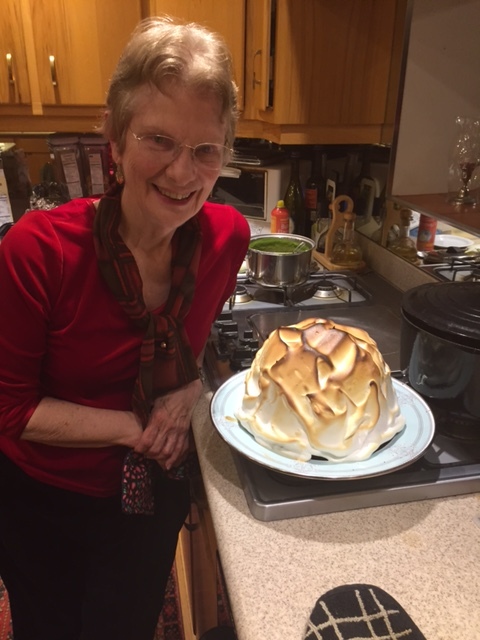 She has some Swedish genes, but passed on the lit candles on the head and served us a fabulous baked Alaska. They turned out the lights in the dining room, poured brandy over the top and lit it. It was beautiful but I couldn’t figure out how to turn off the flash on my phone camera in time to get a flaming picture. Merry Christmas to all. Enjoy this day with your dear ones. We were supposed to go to Washington, DC last Saturday to see my brother and his wife perform with their Scandia Dance troupe. The ice storm got in the way and by eleven in the morning when we needed to leave, the temps on the Eastern Shore were still at freezing and it was colder north of us. We decided not to go. Laura had also invited us to an early Christmas dinner that day and we had turned her down because of our plans to go to DC. But once the no-travel decision was made, I called her and re-invited us. 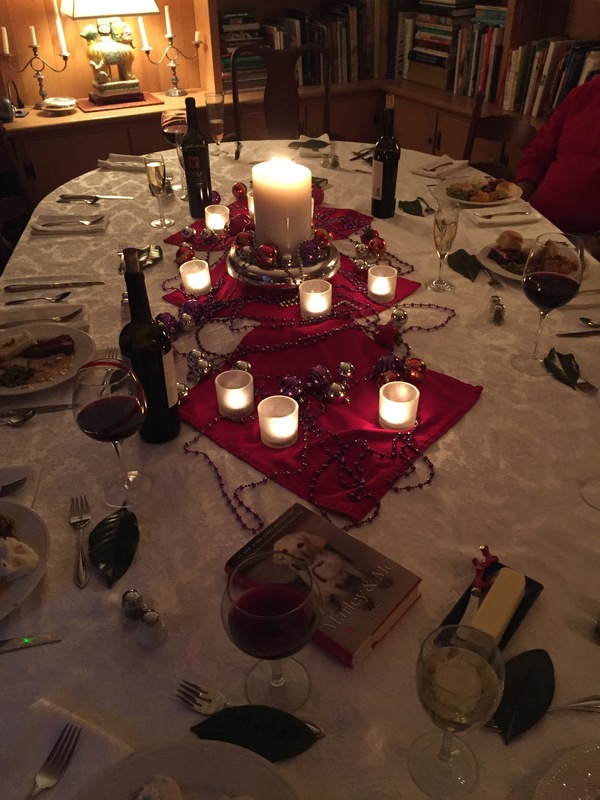 She said it was the third time she’d added place settings to the table, as the number of dinner guests around the table grew. Usually when we are home for Christmas and invited to Laura’s for dinner, I make the desserts. This time someone else had that task. We just showed up for wonderful food, warm friendships, and shared stories. Thank you Laura, it was a gift, as was the sunset out the back of your house as we enjoyed a glass of wine before going to your beautiful table. Wishing all of you a very Merry Christmas, dear friends. 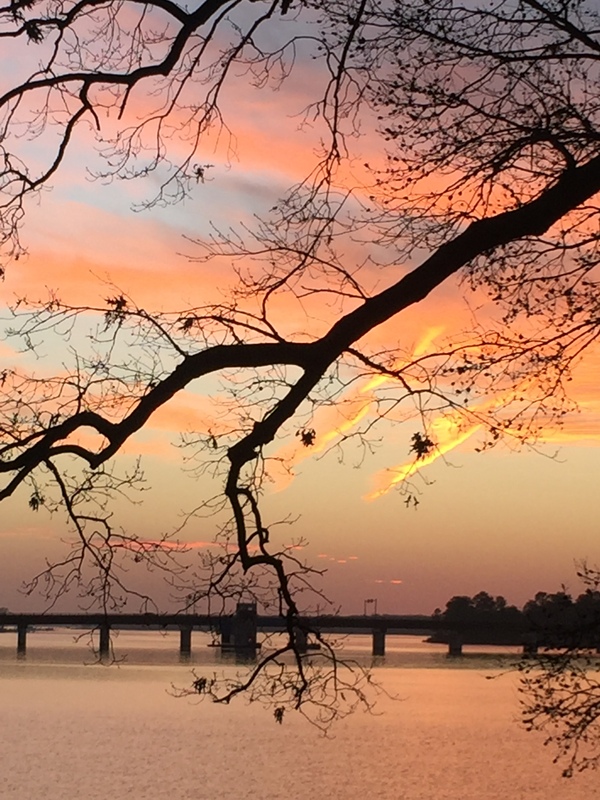 Take time to watch a sunrise or sunset and rejoice in the wonders of our world. I occasionally try new recipes, but the old stand-bys that I have in my head are now pared down to feed 4-6 so that there are leftovers. (When I was cooking for four hungry teens, I made lasagna in restaurant sized pans.) And the tried and true recipes have been modified for food sensitivities we have. I have several friends whose husbands won’t eat leftovers. If my husband ever started down that road, he’d have to fix himself a bowl of gluten-free cereal for dinner. 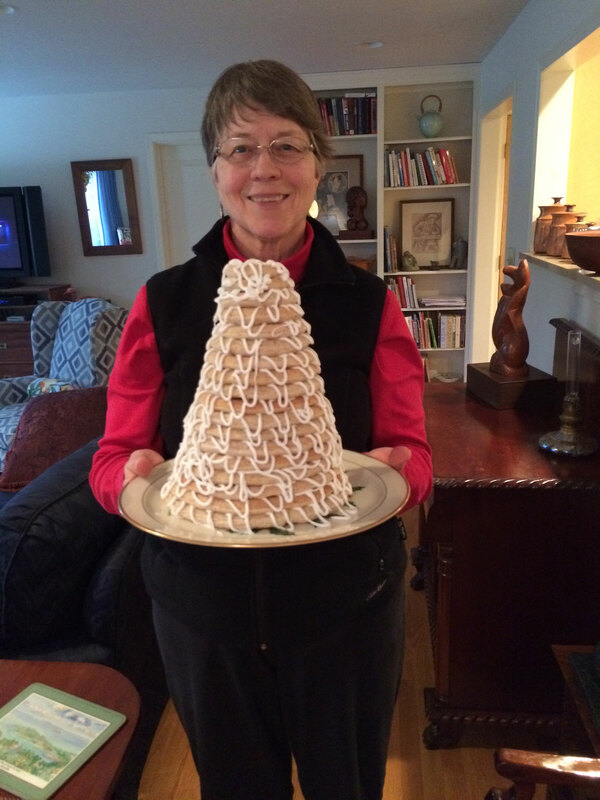 My writing partner, Laura Ambler, is an inventive cook and recently told me that she frequently makes Calamari. 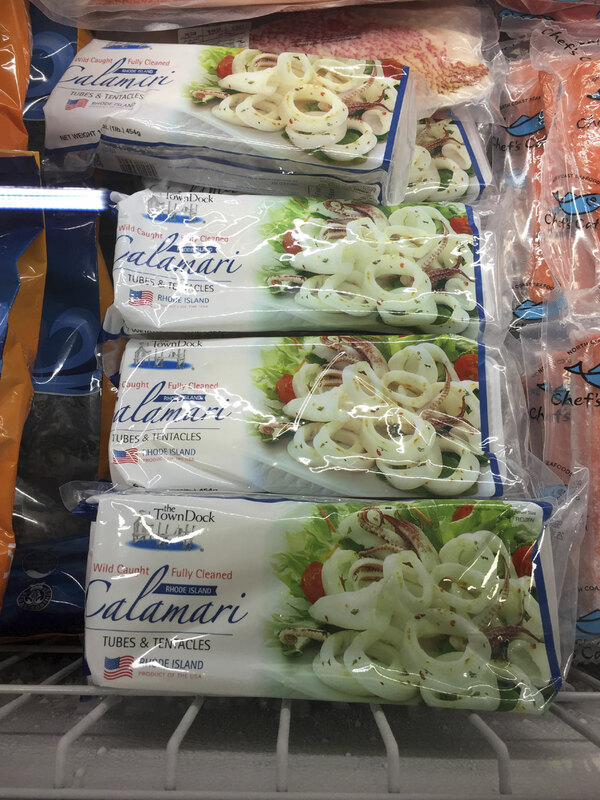 I often order calamari in restaurants, but didn’t even know where to find it in my supermarket. But recently, on a foray to our local big box store, BJ’s, I found it next to the frozen salmon. Turns out calamari is a fairly inexpensive protein. Be adventuresome, I told myself as I bought a box. I went on line to see how to fix it and was glad I did. High heat and short cooking times keep calamari from overcooking which leads to a rubber tire result. This recipe, which I found on Chowhound.com) made a quick and tasty dinner. Cooking the jasmine rice for 18 minutes took the longest. This recipe will go into my rotation. And since what I usually order in a restaurant is fried calamari, I need to try that, too. heat oil in a large frying pan over high heat until smoking. Carefully add squid in a single layer, then add butter, garlic, and parsley. Season with salt and pepper. 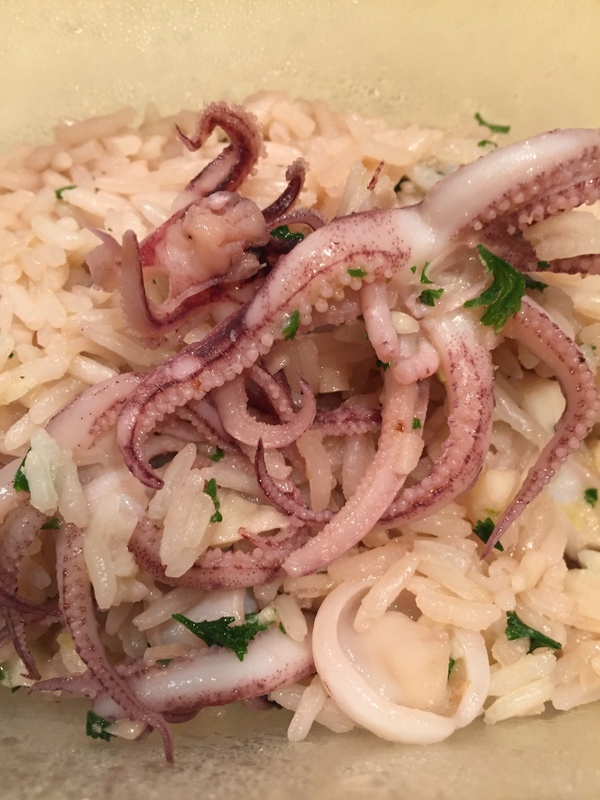 Cook, tossing frequently, until squid is opaque and cooked through – about 1 to 2 minutes (do not overcook). Season with additional salt and pepper and serve over rice. Have you pursued any cooking adventures recently? Successes or epic fails? Last weekend I was a hostess at one of the houses on the Christmas in St. Michaels house tour – a lovely big house, on the Miles River, at the end of our street. Twelve years ago the owners demolished the small rancher (probably just like mine) on that lot and built a new house. It’s really nice. Of course all the houses on the tour are decorated – sometimes by the owners, often by professionals. I had a two and a half hour hostess shift during which I stood near the top of the stairs on the second floor and told people about the three bedrooms and two bathrooms, and the adorable space created when the owner realized what had been in the plans as a storage room had fabulous views. An additional window was added and it was turned into a small fourth bedroom/sitting room. It really was a perfect place to curl up, watch the river or read a book. When I came home I told my husband that these house tours were bad for my mental health. That’s because when I walk back into MY house with the clutter, the dishes in the sink, the manuscript living on the table where we eat, the bed still unmade and the headboard I’ve been thinking about recovering for three years shouting at me…for a very few minutes I believe I live in a hovel. 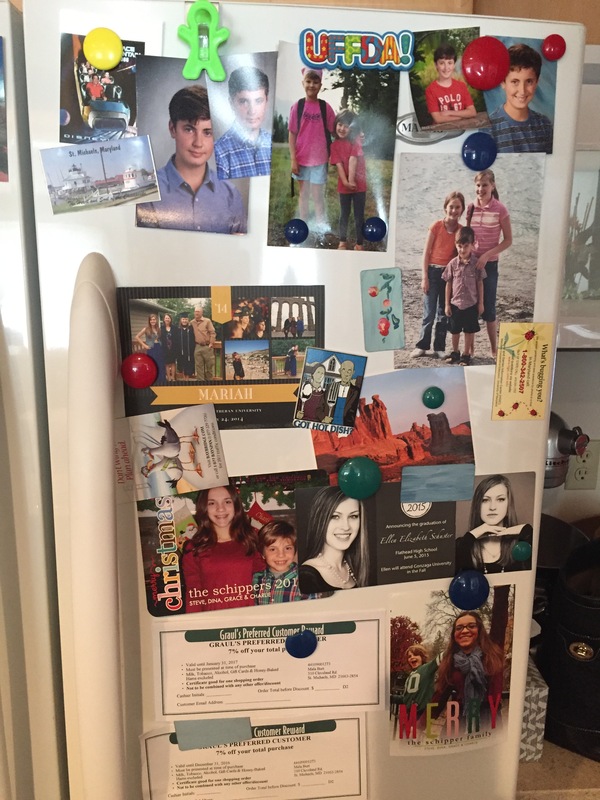 Those hovel thoughts doesn’t last long when I look at the overlapping photos of my grandchildren that cover my fridge. 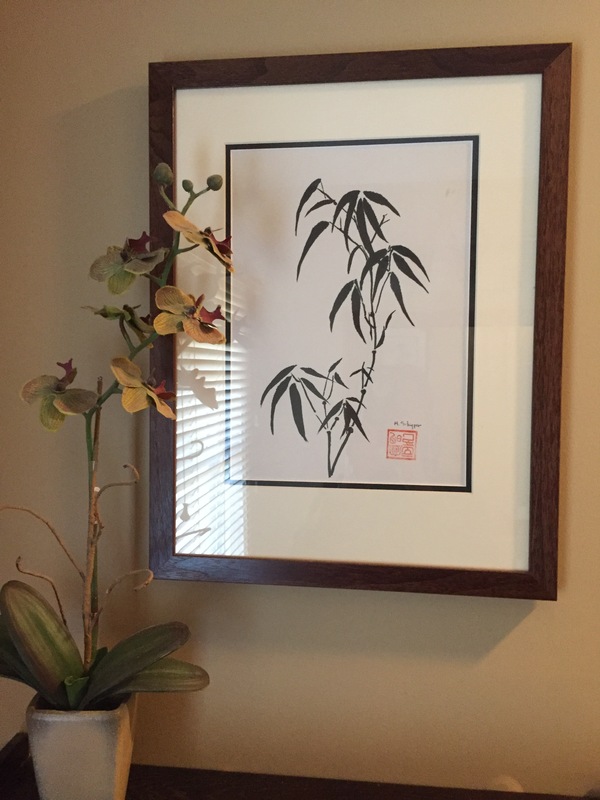 Or the artwork by my mother which adorns many of my walls. That’s when I’m reminded that I love my little one story house that doesn’t hurt my knees with second story steps. I see the only Christmas decorations I have in place. 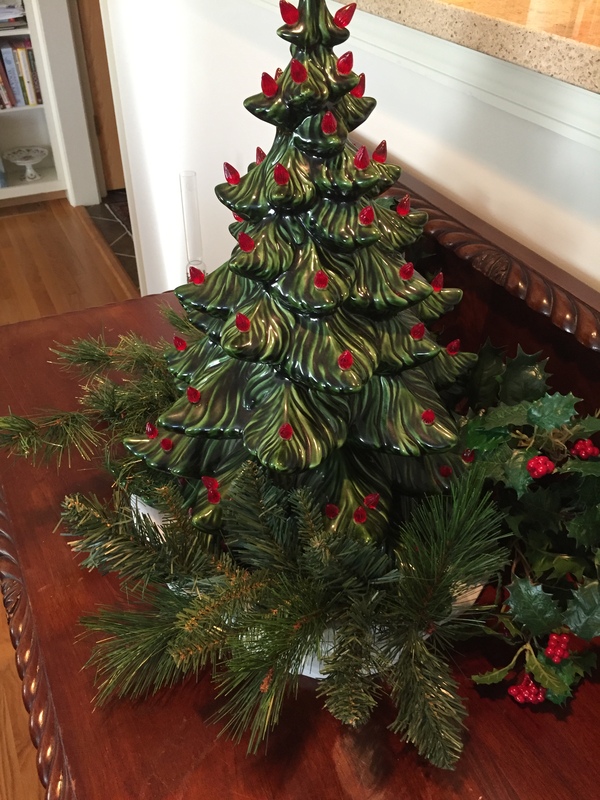 A boxwood topiary tree I made at a Green Thumb meeting and a ceramic Christmas tree that Laura gave me when my husband and I were helping her clean out her mother-in-law’s house. I am beyond grateful that she is in my life with her creative energy and friendship. Maybe house tours are to remind me that most of us live in palaces compared to so many people in the world. A reminder that gratitude should be the order of my days. My fridge is full of healthy food and when I run out, the grocery store is minutes away. I hear the furnace go on and am grateful that we had the money to replace it this fall. During this holiday season, I’ll try to be more present with gratitude for what is already in my life – including my adorable cottage nestled among large old trees and the gardens I’ve created. In my mind it is house-tour worthy. The annual Bay to Ocean Writers Conference is 20 years old in 2017. I attended my first conference the year after we moved to St. Michaels, MD – in 2007. The next year I was on the planning committee doing publicity and have been ever since in various roles. I’ve even been a co-chair with Laura Ambler and Diane Marquette a couple of years. Currently I (with a committee) find the thirty plus conference speakers we need, update the website, oversee production of the conference program, answer emails sent to the conference mailbox, update the evaluation form and pull together the information, and put down tape on the college floor the morning of the conference to make sure people know how to get to the cafeteria and the second building we use. It’s a lot and as much as I love this event that brings an affordable writers conference to the Eastern Shore, this will be my last year doing all these tasks. I need to have time to write. Today I was involved in filming a short documentary about the conference. We talked about how the conference got started and how it has evolved as the publishing world changed dramatically. When the conference began none of us were concerned about marketing on social media and there was no on demand printing. Once the film is available I’ll put it on the website and you can take a look. I am also going off the Eastern Shore Writers Association board in January. I have been acting as the membership chair but we are transitioning to Wild Apricot, a membership software that will do most of the tasks I was doing. More time freed up. This weekend is Christmas in St. Michaels – a 30 year old event that raises money for good causes in the Bay Hundred area. The Bay Hundred is the area from St. Michaels down to Tilghman Island that could muster one hundred militia men during the Revolutionary War. This is a very giving community. People work year round to make this festive event happen. There are so many moving parts beginning with a big party on Friday night. I went with a couple of lady friends one year (there was no way I was going to convince my husband to put on a tux) but after that decided I could donate to the cause and not go to the party. And it wasn’t like I had a closet full of gala outfits. This year they are not calling the event a Gala, but it costs the same. Apparently lots of good food, open bar and music. It will be fun for those who attend and I will be home in my PJs in front of the fire we’re now having every night. It’s very cozy. I baked cookies to be sold at Santa’s Wonderland for Saturday and on Sunday I am a docent at one of the houses on the house tour. It’s down the street (on the water) from my house. My house has a water view if you stand at the end of the driveway and squint. I am hoping to get out to mulch/mow the leaves still on the yard, but winter temps have finally arrived so I may just move the mower from the garage to the shed and call it an end to fall. Then I can organize the garage and think about painting those elephant ear leaf castings I made in October. Our dining out group gathered at our house this week. We’d made a reservation (way in advance) for dinner at Scossa, but they called to say they had double booked the room we were supposed to be in. I knew that meant they had gotten a booking for a larger party than our group of ten. But it all worked out. Some of our group have had health problems this fall and weren’t sure if they’d be able to go to a restaurant. I said come to the Burt’s and if you can only stay twenty minutes it will be okay. If you need to come in your PJs that would be fine, too. Everyone showed up wearing clothes and everyone brought something so it was easy. I did a ham. Another wife made one of those decadent potato casseroles, another a fabulous spinach salad with cranberries and gorgonzola and another green beans with lemon butter. For dessert one couple brought a beautiful trifle that was amazing. It was so light we were all lulled into believing it had no calories. I’m looking out the window of my office at the leaves on the grass. I might just have to dress for Antarctica and start up the mulching mower.